The Himalayas – the land of snow and magnificent monasteries. Stunning scenery and the home of the highest mountain in the world. Without no doubt one of the most remarkable places I have visited. I did a road trip across the Himalayas from Lhasa (Tibet) to Kathmandu (Nepal). To make sure everything was taken care of, including group visa to Tibet and all permits, the tour was booked through an agent in Kathmandu. After four days we left Kathmandu on a one hour flight to Lhasa. Because of the altitude in Lhasa ( 3650m.) we had to spend some days in the city to acclimatize. Not even a headache could stop us from visiting Potala Palace. A magnificent architectural wonder with13 floors, containing more than 1000 rooms, golden stupas and prayer halls. The rooftop white building used to be the living quarters of Dalai Lama. To walk this stairway to heaven was a strenuous climb, with many stops just to catch my breath. But it was definitely worth it. The old town with narrow streets, vendors selling yak butter and prayer flags is a lovely place to spend time. Especially from a rooftop cafe. The main route through Tibet is the Friendship Highway. We made a few detours to visit monasteries and Everest Base Camp (E.B.C.). 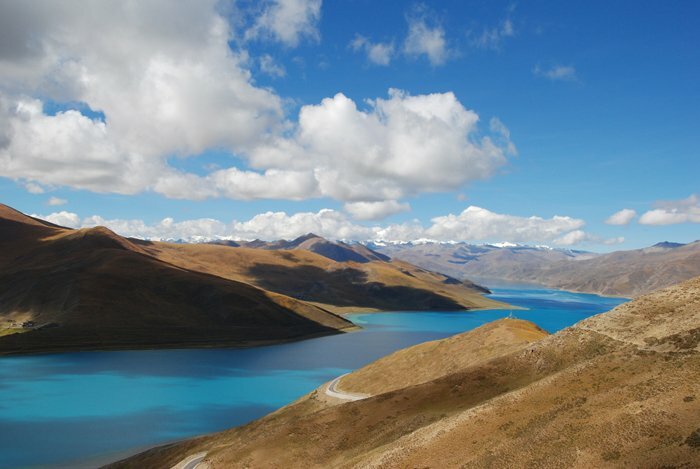 Driving slowly uphill to Karo-la pass (4.794m) reveals a stunning view of the turquoise lake, Yamdrok-tso (4.488m), one of the four holy lakes in Tibet. It is a 7 day walk for pilgrims who circumambulate the lake. In Shigatse we spent the afternoon in Tashilhumpo, founded in 1447 by a desiple who was named the first Dalai Lama. A large, beautiful monastery and one of the few that has survived the Cultural Revolution almost untouched. A real pleasure to wander around here. Our last night before Everest was spent in the monastic town of Sakya, established in 1268. It was built as a defense fortress with watchtowers in each corner. The landscape is barren and moon-like. A dusty place where I'd rather stay inside! Because of the altitude, the nights were now getting colder. From now on we slept in our woollen underwear. The hotel room did not have any kind of heating. Mt. Everest is easy accessible from the Tibetan side, because it is possible to drive all the way. In Nepal the only way is to walk. After several hours of driving we were face to face with Mt. Everest (8.850m) or Qomolangma, the Tibetan name. A stunning sight. Hard to describe the feeling standing in front of this massive, snow capped peak. It turned out that our room at the Rongbuk guest house came with a view! But it also came with a crack in the window and since the room didn't have heating, it became freezing cold during the night. Slept with everything made of wool and blankets on top the sleeping bag. In the morning the tap water was frozen. Washing our faces and brushing teeth had to wait until the water was defrosted. On our way to B.C. After a rather sleepless night and a light breakfast we went to E.B.C. It is only a short walk, but we hired a horse carriage to take us. The view of the surrounding mountains was a sight we could enjoy all the way, but by the time we were there, clouds had started to gather around the top. But we were there! Edmund Hillary and Tenzing Norgay were the first to reach the summit of Mt. Everest in 1953 from the Nepalese side. Before them there had been 13 attempts. Most famous is George Mallory who made the attempt in 1924. In the early 1900s Nepal was closed to people from the west. When he made the attempt, he had to do it from the Tibetan side. He and his partner disappeared on the North-East ridge and were last seen 245 m. from the summit. In 1999 an expedition found his remains. Whether he and his partner had reached the summit before they died is not known. From Rongbuk we continued on the Friendship Highway, passing villages like Tingri, the Tibetan plateau with snow capped mountains until we were greeted with the greenery of the foothills. After a night in Nyalam (3.750m) we drove the last 30 km. to the border town of Zhagmu. The descent to the border was a steep zigzagging ride with a steep gorge on one side. I often felt we were dangerously close to the edge, but very happy to be the one sitting in the middle between my two friends! Eventually we reached the border. The driver left us here to walk across the Friendship Bridge on foot. Even it had been one of our greatest adventures, I was looking forward to a good meal and a warm room in Kathmandu! Please do follow if you want to keep up with my next travel story. Any upvotes or resteems are hugely appreciated!